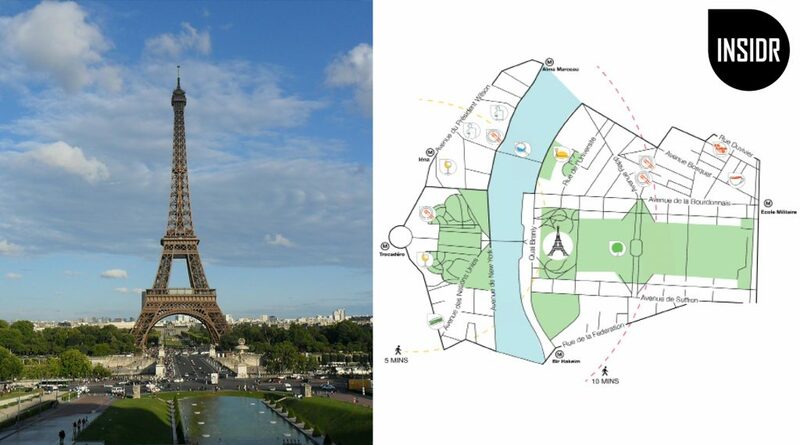 Download our Eiffel Tower Map right here! he Eiffel Tower is perhaps the first, if not the only, attraction first-time travellers to Paris want to visit. There’s no disputing the fact that the tower has achieved such an iconic status that even locals like us still find ourselves delighted every time we see it. The popularity of the Tower has spurred a great number of establishments around like restaurants, tour operations, and souvenir shops. But like in most other places in the world, popular places like this are surrounded by tourist traps. 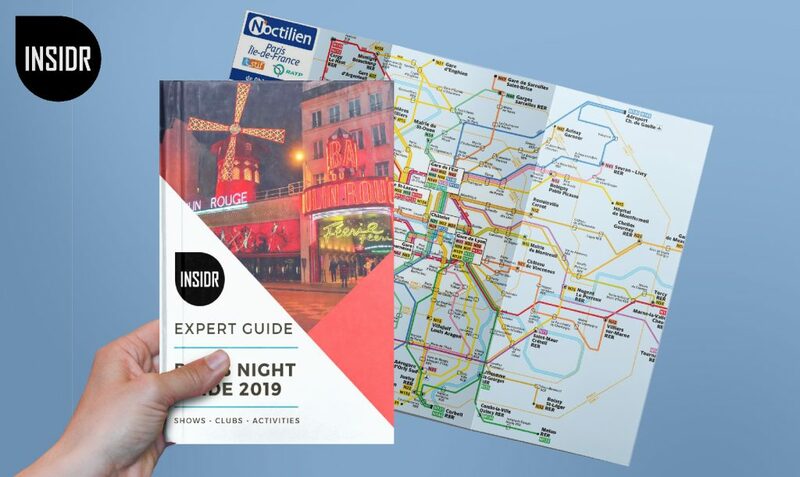 Hence we’ve taken it upon ourselves to create an authentic guide for the area. You’ll find other attractions worth stopping for as well like great restaurants that have great views of the Tower! What is in your Eiffel Tower map? 10+ recommendations of the must-see sights in the Tour Eiffel area, including sights, museums and of course our best restaurant recommendations! The Eiffel Tower isn’t the only attraction in the area! We’ve listed down below the other spots that are definitely worth going to when you’re around. 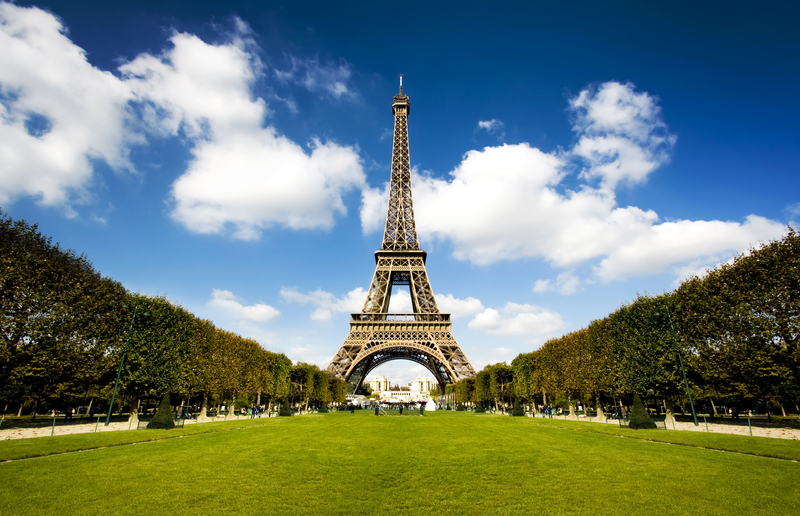 Discover all our best Paris attractions on our visit Paris travel guide. Parc du Champ-de-Mars, as per its official name, is a vast public garden that locals and tourists alike can freely visit at any time of the day. Not only is the park being manicured to perfection, it is also the closest spot you can admire the Eiffel Tower from. During the warmer months, people set up their mats on the gras where they lay down, read a book, or have a picnic. It gets even better at night when the nightly Eiffel Tower light show starts! Palais de Tokyo is a building that houses modern and contemporary art. It is the first place in Paris you should go to for a glimpse of art that is thought-provoking, intriguing, and sometimes even unnerving. When the museum hours are over, you’ll still sometimes see a long line of people outside waiting to gain entrance into YoYo, the nightclub, located in the building. Palais de Tokyo also recently opened a new restaurant, Les Grands Verres serving sustainable produce and delicious cocktails! Located just right next to Palais de Tokyo is Musée d’Art Moderne de la Ville de Paris. This museum is dedicated to modern and contemporary art of the 20th and 21st centuries. The permanent collections of the museum include works by Pablo Picasso, Henri Matisse, and Georges Braque. The best part of it all, access to the permanent collections is FREE! Have you seen the film Inception? If you have then the Bir Hakeim Bridge may look familiar to you. We’ve included this as an attraction in our Eiffel Tower Map because it’s one of the best, yet most unexpected places to see the famous tower from. 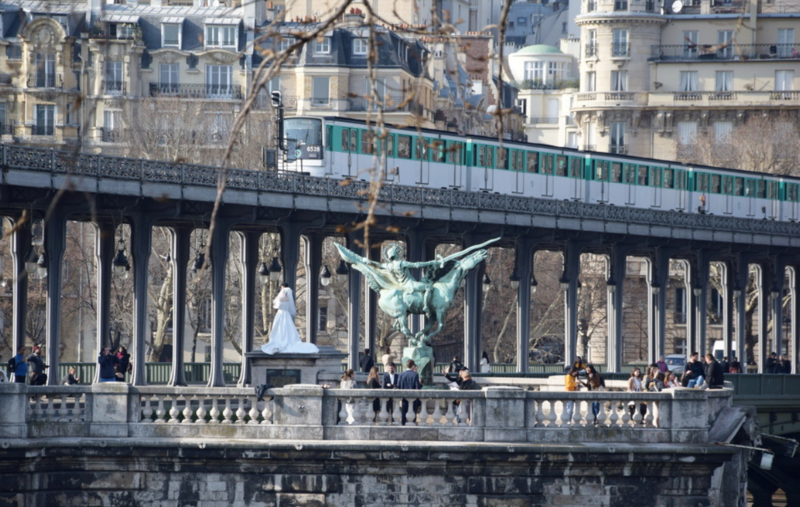 After you’re done taking your photos under the iconic bridge, we recommend taking the metro from Bir Hakeim station just upstairs. Line 6 bound for Charles de Gaulle Étoile will take you across the bridge where you can see the Eiffel Tower very clearly! We’ll be honest with you. The Eiffel Tower area is dotted by many restaurants and cafes that serve over-priced and mediocre quality-food. It’s hard to know which places aren’t tourists traps. But we’ve done our research and so we’re able to come up with a list of genuinely good restaurants in the area! 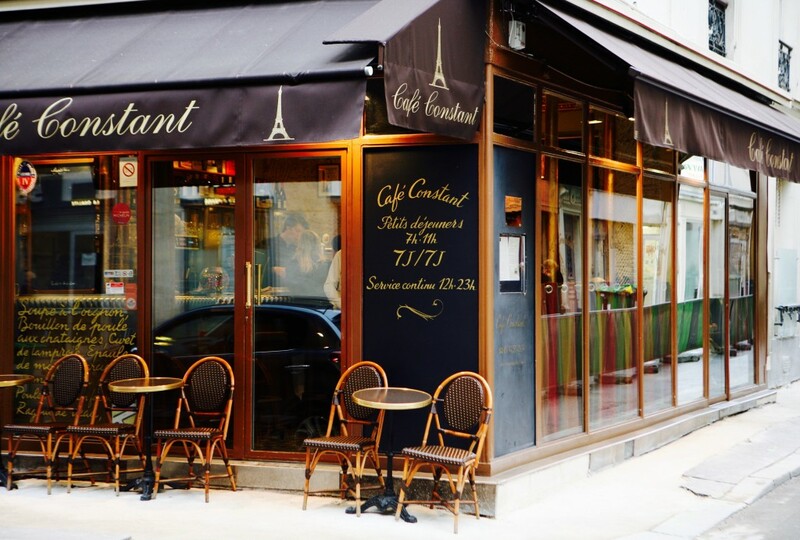 Café Constant is the casual dining restaurant of famous chef Christian Constant. Here, you can enjoy a 3-course meal of hearty French classics like seafood tartare, roasted chicken with herbed butter, and vanilla rice pudding for €37. This is a great restaurant to include somewhere in your plans of enjoying the Eiffel Tower. Another restaurant in the area worth checking out is La Fontaine de Mars. This restaurant will treat its guests to a very traditional French bistro ambiance. We love the patterned tiles, wooden chairs, and dapperly-dressed servers. Order their house specialty of duck confit with a side of fries. If you’re feeling a little adventurous, get the andouillette sausage! Café de l’Homme is a popular fine dining restaurant near the Eiffel Tower. While the interiors are intriguing, the outdoor seating can’t be beat. 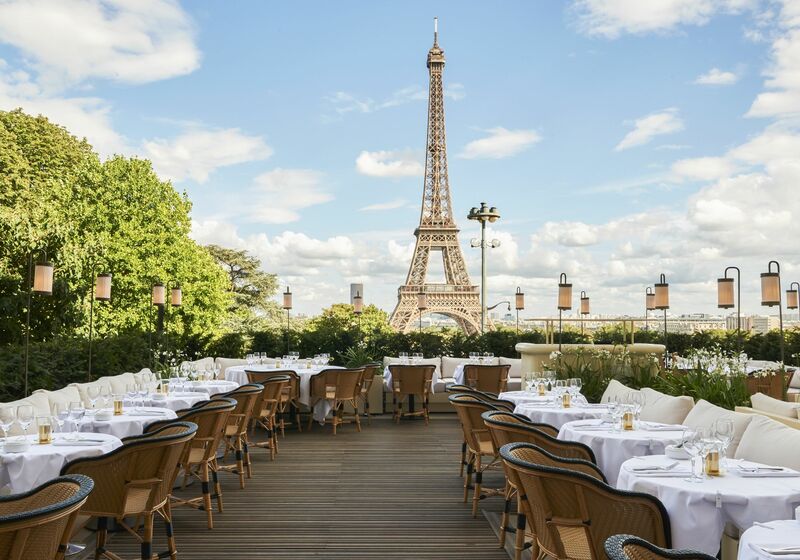 As you enjoy the delicious gourmet offerings of the restaurant, expect to pay a premium on the food for the priceless view of the Eiffel Tower. Girafe restaurant was conjured up the same people behind Paris’ most chic dining spots Loulou, Monsieur Bleu and Perruche. This only means that you should expect no less than an impeccably designed space. While it is definitely a place where your eye can travel, it’s also where your stomach can be satisfied. What’s more? The restaurant has views of the Eiffel Tower! For a more affordable dining option in the area, we suggest enjoying the savory and sweet crêpes at Crêperie Framboise! We love their ‘formule’ for lunch! A specialty buckwheat crêpe + a dessert crêpe + a cider and all for only €16.20! If something light is what you’re in the mood for, we suggest heading to Kozy which is a play on exactly how you’ll feel inside the café—cozy. They have a wide selection of drinks like coffees, teas, and juices that all pair up nicely with their home-made sandwiches, soups and salads. For something that’ll last you longer, they also have a small selection of warm dishes like risotto, curry, and pasta. 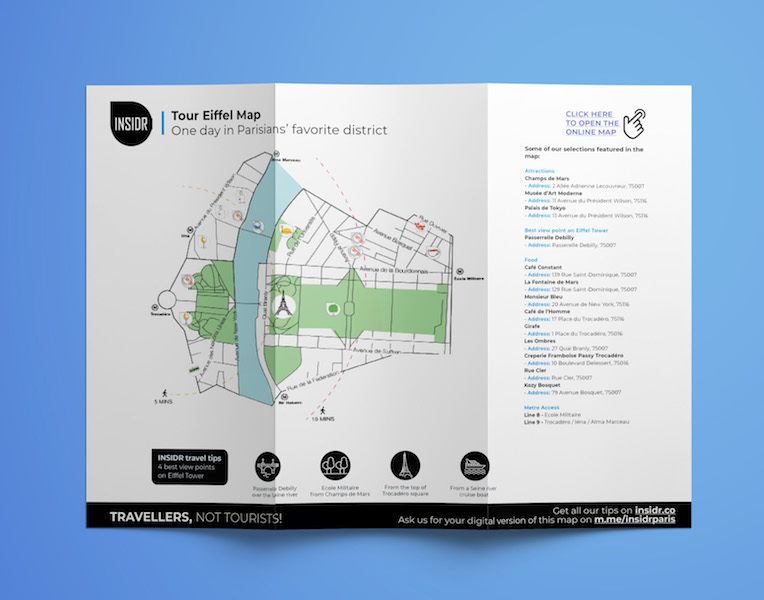 Get your Eiffel Tower Map right now! To be honest, there isn’t a great selection of establishments to shop from surrounding the Eiffel Tower. If you’re only interested in those cliché Eiffel Tower key holders, you’ll find plenty! But in our opinion, bringing back home souvenirs that can be used are the better option. We recommend shopping at Parapharmacy Monge for its wide collection of skincare products that extend outside of French brands. The best part of it is that this is only one of the few places in Paris that offer a direct tax refund! Across the parapharmacy is Perfumery Monge where you can buy signature French scents. Check out our guide to the top 20 French skincare products to know the ones you should be purchasing! You liked our Tour Eiffel map? There are more free INSIDR Travel ressources for you!